Not only is Cameco poisoning northern Saskatchewan through its uranium mining practices, but it is also poisoning the minds of children who happen to take in the Much More Munsch display at the Children’s Discovery Museum in Saskatoon. As corporate sponsor Cameco gets to demonstrate how generous it is to the community while in the north it contaminates plants and wildlife, lakes and rivers, the earth and its people. Interestingly, Munsch’s publicist claims Munsch has nothing to do with that traveling display. How Munsch can possibly extricate himself from the merchandizing and characterizing around it is beyond me! The brochure for the display even thanks him and Martchenko (his illustrator) for their collaboration on it! After several emails, I’ve decided to quit trying to understand it, to boycott Munsch, and to post this here. In other Cameco news, today we learn that the company is also going to poison China, by increasing sales to that country so that the Chinese government can fuel a reactor in order to meet China’s increased energy demands. Cameco Corp., the world’s second- largest uranium producer, agreed to supply the fuel to China Guangdong Nuclear Power Holding Co. through 2025 to meet rising demand in the world’s fastest-growing nuclear market. Cameco plans to sell 29 million pounds of uranium concentrate to China Guangdong Nuclear, subject to the approval of the Chinese government, the Saskatoon, Saskatchewan-based company said in a statement yesterday. That’s equivalent to about 13,000 metric tons. I guess we can call it fair if kids in both countries are poisoned, eh? Updated: Wall deflecting for Harper? 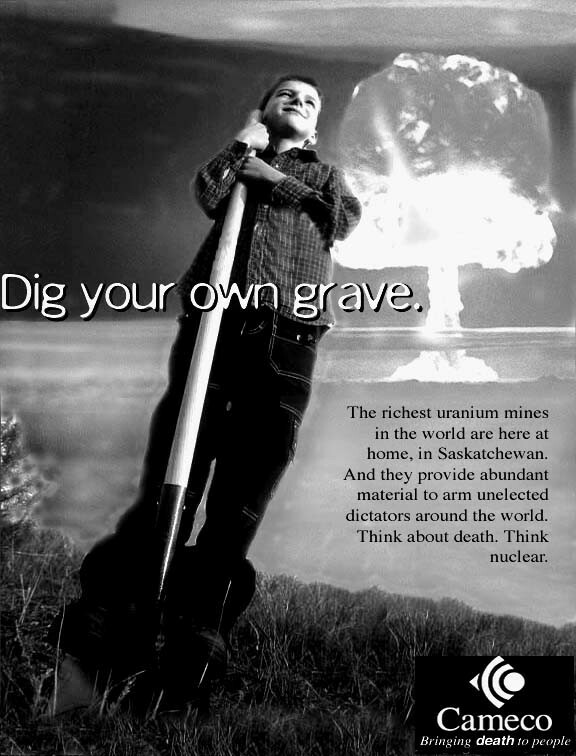 Brad Wall, the Premier of Saskatchewan, steps into the uranium issue at an interesting time. He’s off to the First Minister’s meeting, having completely changed his tune on equalization. The media and national politicians have their eyes directed towards the Harper government’s most recent attack on the President of the Canadian Nuclear Safety Commission (CNSC), Linda Keen. The attacks, both in the House in December and in the correspondence made available to the media, are unfounded. They are personal and partisan and based on an issue which the Harperites continue to convolute and obfuscate. Keen’s letter to Lunn notes that a special meeting with Lunn took place after a conference call and Minister Lunn stormed out partway through. The formal directive on which Mr. Lunn bases his attack, was received by the CNSC after the issue appeared on the Order Paper in the House. How could Keen have possibly acted earlier, especially when there are laws dictating how she must act? Isn’t it obvious, then, that the attack on Ms Keen comes because she refused to bend the law and succumb to the will of the Harperites? Oh, and did I remember to mention that the meeting was about the MDS-Nordion million-dollar medical isotopes issue? Saskatchewan Premier Brad Wall wants the province to get some environmental credit for the uranium it mines, but an environmental group is highly skeptical. Wall argued Tuesday that nuclear power offsets the amount of fossil fuels burned in the world. Most people who have thoroughly researched the nuclear fuel cycle will have to acknowledge that huge amounts of GHGs are emitted at every stage of that cycle, from cradle to grave — and there is no grave for radioactive waste! It often moves from storage facility to storage facility. I can’t help but wonder if Mr. Wall is able to pay his staff so very well because of kickbacks from the pro-nuke lobby? Granted, Mr. Wall’s staff are new to this government thing and will, of course, support Mr. Wall’s partisan agenda. And memories of the Devine regime remind SK-dwellers that, in the right wing world, partisan politics and the lining of one’s own pockets trumps morals any day. I wish I could pull from my memory each and every one of the issues on which Devine and Mulroney colluded and obfuscated. Are we seeing history repeat itself? Mr. Wall would be well advised to acknowledge that the supply of uranium is limited to only a few short boom years. We need to look ahead, beyond short-term gain, to the future of our children’s children. So, instead of wasting time and energy on a backwards and dying industry, why not invest in something modern like a solar power plant to produce energy? The USA and Spain are already there. We could be in on the leading edge, especially with our sunny days! These plants focus sunlight onto pipes which carry a ”hot oil,” Therminol 66. One class of solar collectors raises the temperature of the oil to 345 degrees Celsius (650 Fahrenheit). A large thermal reservoir can store a large amount of solar energy, enough for two weeks. The oil is never burned, however; it is continually recirculated though the pipes and the storage containers. The heat drives steam generators and turbines in order to generate electricity. Variations can be used with fibre optics to light buildings and heat water. Though it wasn’t the case a decade ago, there is now a lot of expertise and experience on solar power plants, enough to safely and economically put the hoped-for nuclear renaissance to its grave, once and for all. Solar is an industry waiting to grow! Wake up and turn on the lights, Mr. Wall, this is the 21st century, after all. The National Academy of Science, a group of scientists based in Washington that advises Congress on a number of issues, has been asked to consider four questions — all relating to the supply of medical isotopes, and whether the U.S. should consider producing its own. At the request of NIH Director Elias Zerhouni, the National Academies have begun a year-long review of the state-of-the-science in nuclear medicine. This study results from the uncertainty about future federal funding for nuclear medicine research that accompanied the drastic reduction in support for the Medical Applications and Measurement Sciences (MAMS) program that had been supported by the Department of Energy for decades. The MAMS program was virtually eliminated in the Administration’s 2006 budget and was again not included in the 2007 proposal. * impacts of shortages of isotopes and highly trained radiochemists on nuclear medicine research, and short- and long-term strategies to alleviate these shortages if they exist. No wonder the Harperites are all worked up! Their buddies might end up going elsewhere for medical isotopes. UPDATE 2: Jason Kenney’s been shooting off his mouth, thinking he knows something. There was no crisis, Jason! But I guess this tells us something about the sorry state the Harper government is in on the issue. POGGE has the stuff. I missed that the Auditor General’s report on AECL had been released. (Damned real world! Or was it the Obama /Clinton thing?) According to this report, Minister Lunn may well have known months agothat the reactor at Chalk River was experiencing difficulties. Natural Resources Minister Gary Lunn may have known in September that the Chalk River reactor needed improvements to protect public safety, months before it was shut down, according to an auditor general report released Tuesday. Auditor general Sheila Fraser said she presented a report on Atomic Energy of Canada Ltd. (AECL) to the corporation’s board on Sept. 5, 2007. Never a dull moment in the nuke world, is there?